Region of Usti nad Labem, in a bee line 5 km south from the city Litomerice. 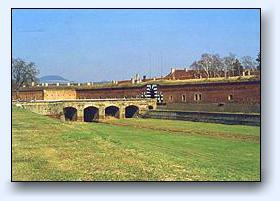 Terezín was established at the end of the 18th century as a fortress; still surrounded by its massive ramparts, the town lies at the confluence of the rivers Labe (Elbe) and Ohře (Eger). 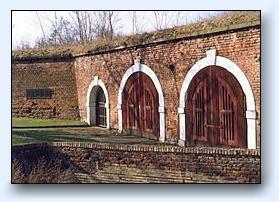 The Main and Lesser Fortresses at Terezín, although modern for their period, gradually became obsolete, and having lost their military function fell into disregard. Only in the relatively recent past has Terezín once again entered the world\'s public consciousness as a tragic symbol of the sufferings of the tens of thousands of innocent people who died here during the Nazi occupation of their homeland. 07.11.2002 - 28.02.2003 Dessa Petroz, Switzerland - A Legacy from Terezín - paintings inspired by Viktor Ullman´s Piano Sonata No.7. 06.02.2003 The Book of the Memory - an exhibition of graphics of Mexican artist Bela Gold - Ghetto Museum Terezín. 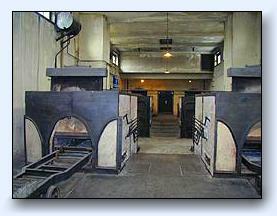 29.04.2003 Yom Ha´ Shoah - commemoration of the victims of holocaust; at 2 pm in the attic of the former Magdeburg Barracks. 14.05.2003 14:00 - 10.08.2003 Luděk Tichý - Ex Amore et Dolore - foyer of the cinema in the Small Fortress. 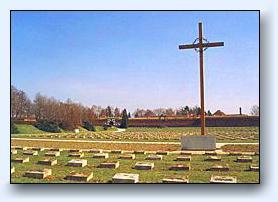 18.05.2003 10:00 Terezín Commemoration Act - at 10 am on the National Cemetery at the Small Fortress. 10.07.2003 - 30.10.2003 Für das Kind – Kindertransport Memorial Exhibition. In tribute to the memories of children who survived the holocaust. Photographs with engraved original texts. ROSIE POTTER & PATRICIA AYRE. 14.08.2003 Wojtek Polcyn - graphic art - foyer of the cinema in the Small Fortress. 06.11.2003 An exhibition about the activity of the Educational department - of the Terezín Memorial, anniversary - 10 years of the working - Ghetto Museum Terezín. Without guide or with guide, 90 min. Pruvodcovsky vyklad je nutne pisemne objednat. Reservation of tours, saling the souvenir, archiv, vzdelavaci seminare.